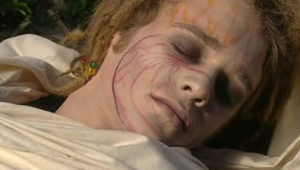 Zoot is seen in the first episode of the tribe and by episode eight he is dead, but even death does not stop him from appearing again in tribe. Zoots real name was Martin and he was Bray's younger brother. 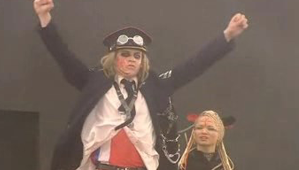 After Martin's parents die of the virus he becomes angry, and snaps at a teacher by standing on a desk and yelling 'Power and Chaos' and so Zoot was born. Martin decided to call himself Zoot, and wore white contacts over his eyes. He started to prepare for a future without adults by creating a tribe that would control the new world. Zoots future world would be about chaos and the strongest reigning supreme. So the slogan 'Power and Chaos' became Zoots battle cry. 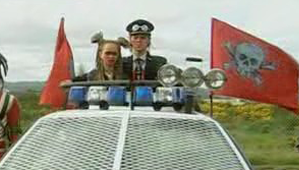 In episode one Zoot is seen standing on the back of a police car surrounded by his Loco tribe on roller blades yelling 'Power and Chaos', While the police car has its lights flashing, and the siren screaming as it rushes through the streets. The sight of this creates fear and terror in the hearts of the city kids. Trudy gives birth to Brady, Zoot's daughter. Bray contacts Zoot and convinces him to meet Trudy and Brady in the mall at night. The Mall Rat's wake up to find the leader of the Loco tribe in the mall. Zoot tries to escape when he encounters Lex and they fight. Lex pushes Zoot over a railing sending Zoot to his death. Trudy, Amber, Bray, Jack and Del give Zoot a Viking warrior burial at sea by setting fire to the boat. Zoot's influence can still be felt as a former member of the Locos creates a new tribe called the Chosen to worship Zoot and follow his ways. At one point they capture Trudy and Brady to create 'The Holy Trinty', and take over the city. There is also a flashback episode in season two showing how Bray, Trudy, Ebony, and Martin lived before the virus, and how Martin became Zoot. Later Mega and Java create a hologram of Zoot to try and take over the city. They trick Ebony into creating a new Tribe the 'Zootists' and get Darryl to dress up like Zoot to convince everyone Zoot has come back. Zoot only wore one outfit. Starting with leather bikers pants that are blue in the back, and red in the front. A long white sleeved shirt, and a black tie. A red top that sits over the white shirt, and an old navy blue suit jacket. On the front of the jacket it has several safety pins, and chains, which go around to the back. The back of the jacket has a white square flag that says 'keep warm burn out the rich'. On his head he wears an old navy band-player's hat with old motorcycle helmet goggles that sit on top. He has red face paint on his left cheek, and black face paint around his eyes.